Returning to Hanga Roa from fieldwork in Rano Raraku, we followed the same route every day for a month. Nearing the village, we always turned to run parallel with the airport runway. My eyes grew accustomed to the same daily blur of greenery along the opposite side of the road, and details were registered only in passing. Then one day I suddenly realized that an awkward shape standing in Nely Pakarati Manutomatoma’s neatly trimmed garden was oddly familiar. 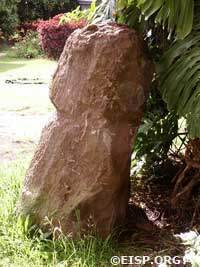 Cristián turned the truck around and we drove into her driveway where, standing propped against the house, we were stunned to recognize a large, broken, and only roughly carved red scoria moai! Nely told us that she and her family had recently found the statue, buried face up, when they had laid a foundation and concrete floor for a new terrace. She was very fond of her statue and thrilled when we carefully documented it for the EISP database. 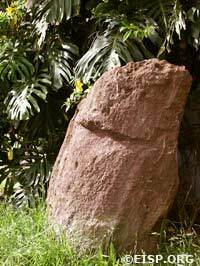 It joins the very small number of important and, in many ways, enigmatic red scoria statues we have recorded to date. Island youngsters Edison Herrera Flores, Te Kohu Cristino, Patricio Perez, and Alberto Alarcon were digging a shallow hole to erect a paepae(temporary house) near one of the boys’ homes in the vicinity of Mataveri. 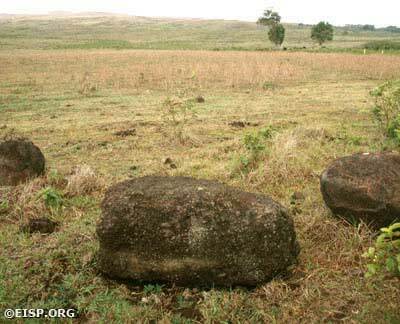 Suddenly, their shovels struck a rock they immediately recognized as Rano Raraku tuff! They promptly reported their find to the proper authorities. On a rainy Sunday in early November we visited their paepae and, with their willing help, uncovered a torso and a fragment of a head—once a moai about 1 m tall. This area of the island had been, it was thought, thoroughly surveyed more than 30 years ago, but this new statue was never seen. It has been duly added to the ever-growing EISP database and the boys, needless to say, deserve a big “hooray!” for their good citizenship! Sketches and measurements of a torso and a fragment of a head in Mataveri by Cristián Arévalo Pakarati © 2003 EISP. EISP is a systematic, quadrant by quadrant survey that is always undertaken in an organized manner. We usually know what to expect, but we still encounter the unexpected! 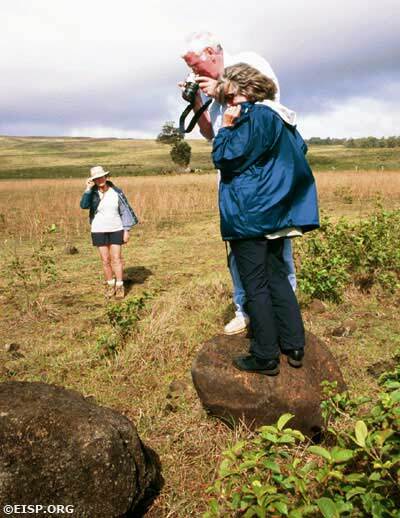 Traveller Tour guests help EISP document a newly recorded torso. Photo by Pam Davies ©2003 EISP. One day earlier this year, while horseback riding between Ahu Tepeu and Ahu Akivi, we stopped to take in the view. Looking down, we saw a cluster of what appeared to be ordinary rocks. Most of them, we thought, had probably been thrown up recently by a passing road grader. We were stunned when closer inspection revealed one of them to be a moai torso! Broken and very eroded, it was just 1.33 m long! We made a mental note to come back and have a closer look, and then rode away. In November—during our yearly touring as accompanying experts with British Museum Traveller—we passed by our discovery again and decided to capture the moment. The bus pulled over and some of our more game participants eagerly jumped from the bus, climbed the barbed wire fence, and set to photographing and taking compass bearings. With their kind help, this little torso is now properly recorded in the EISP database! Newly recorded torso. Photo by Pam Davies ©2003 EISP. Sketches and measurements of newly recorded torso by Cristián Arévalo Pakarati ©2003 EISP. Our observation, based upon the three new moai described here, is that our computerized database will never be closed. It must remain an open, adjustable, and growing body of information that responds to new discoveries. As the island community begins to use the land in new ways, and as people increase in number and expand their boundaries of activity, it is probable that additional statues will be found. These can and should continue to be added promptly to the EISP inventory. We are grateful for the open lines of communication and cooperation that EISP enjoys with so many Rapanui people and island agencies. Archaeology, in this way, becomes a valuable bridge between the past, present, and future, and insures the preservation of Rapa Nui patrimony.